On January 19th, 2014 at 6:28am we excitedly welcomed our second born, and first son. Timothy was born a healthy 9lbs 7oz after 5 hours of labouring at the hospital. 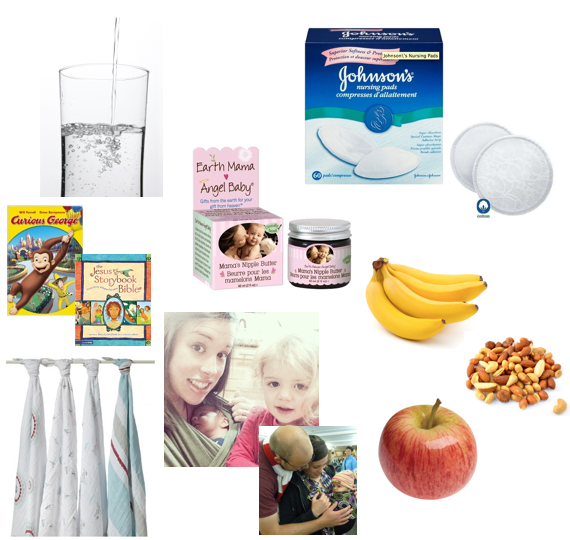 I thought I would put together a list of seven of my “must-haves” for having a newborn and a toddler. This list is especially geared towards the first few weeks and as I’m breastfeeding has some things I think are essential for that. 1. Water – Keep yourself hydrated! Not only will it help with your recovery and energy it’s also good for you! Breastfeeding in particular makes you thirsty, so keep that water handy! 3. Breast Pads – Until your milk regulates you are probably going to have an oversupply, or the other side will also letdown while you’re feeding. These will keep your bra dry. There are many types, disposable, washable and even ones to collect excess milk. b) Books/Colouring/Quite Activities – Alternative activities to screentime that are also quiet and slightly independent are also helpful to have handy. Keep them in easy reach so your toddler can grab them while you’re feeding or you can grab them when you only have one hand free. 5. Muslin Swaddling Blankets – These ones are my favourite. Muslin is such a great material because it keeps them cool in the summer and warm in the winter. If you’re crafty, Jordan posted some directions on how to make your own here. 6. Baby Sling/Wrap/Carrier – So great for when you need to have your hands free but your newborn wants to be held. I have both a wrap and a sling and I LOVE them. 7. Healthy Snacks – Keep healthy snacks you can grab when you or your toddler is hungry. So many times I’ve found we (me, toddler and newborn) are all hungry at the same time. Set your toddler up with a snack, grab yourself a piece of fruit (and glass of water!) and you can sit down to nurse your newborn without all having to wait forever to eat. When those marathon feeding sessions happen you’ll be glad you grabbed that handful of nuts, granola bar or fruit before you sat down. What are your must-haves for early days with a toddler and a newborn? This is not a sponsored post, none of the companies linked to has a clue who I am.